grandma's cookie jar: American Girl Doll Give-Away & It's French Bread Day! American Girl Doll Give-Away & It's French Bread Day! Do you enjoy baking? What is your favorite thing to bake? Do you like to bake bread? What is your favorite bread recipe? Today is French Bread Day . . . if you like to bake homemade bread, this is a great day to bake some french bread! This year the Girl of the Year doll from American Girl has grandparents and an aunt and uncle who are bakers with their own bakeries. Grace, the 2015 Girl of the Year, loves to bake as well and wants to one day have her own bakery - as we learn in the story which comes with Grace. 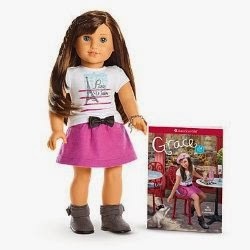 In just a little over two months, on May 24, 2015 I am giving away one American Girl Doll and Paperback Book - Grace, the 2015 Girl of the Year doll (USA only)! If you live in the USA, are over the age of 18 and would like to be included in the drawing for Grace - which will be on May 24, 2015 (during my Month of Birthday Give-Aways), please comment below to let me know your favorite homemade bread memory! I actually live in the house my dad was born in. I remember sleep-overs in this house with my grandparents. My grandma often made homemade bread and if I was at her house when a loaf came out of the oven, she would give me a slice of bread with Peter Pan peanut butter on it! So yummy! Now I'm the grandma and my grandsons come here for sleep-overs . . . and they also love t eat a slice of fresh baked homemade bread! In addition, you will receive additional entries if you have followed on Google+, Google Friend Connect, Pinterest, followed by liking on facebook with the tab at this link (not just liking the post) and/or have followed grandma's cookie jar by email. For each of these which you have done you will receive one entry. Plus, if you "share" this post, you'll receive an additional entry (please let me know if you share). If you tweet this post, you will receive a maximum of one entry as well. This will help me be able to draw names from among people who would like to win American Girl Doll and Paperback Book - Grace, the 2015 Girl of the Year doll and it gives you several ways to enter the give-away! Please keep in mind, each time I post about this give-away, you have the potential to receive up to ten entries (one for commenting - this time about your favorite homemade bread memory - and one for each way you have followed and for each share - up to ten entries for each post.) Thank you for reading grandma's cookie jar and for sharing it with the people you know! My adopted grandma used to bake bread and homemade herb rolls just for me. I still miss them! My kids love it when I am making bread. They each get a little piece to shape as they wish and it's always soo delicious fresh from the oven. I only have made bread using a bread machine. I have, however, made yeast rolls which are really yummy. I like to visit restaurants that have homemade breads like in Frankenmuth and Amish country. I follow on facebook and email. Making french bread for the first time. It turned out dense but made awesome breadcrumbs for chicken! My mom made awesome zucchini bread. We usually had some during the holidays. Liked shared follow FB, Google+, email , pinterest and twitter. I love baking bread with my daughter. My mom is always making sourdough bread. Brings back good memories of helping her in the kitchen as I was growing up. I follow via by email. I have a wonderful husband who makes fresh bread on special occasions. What a yummy treat that we all love. Smells so good!